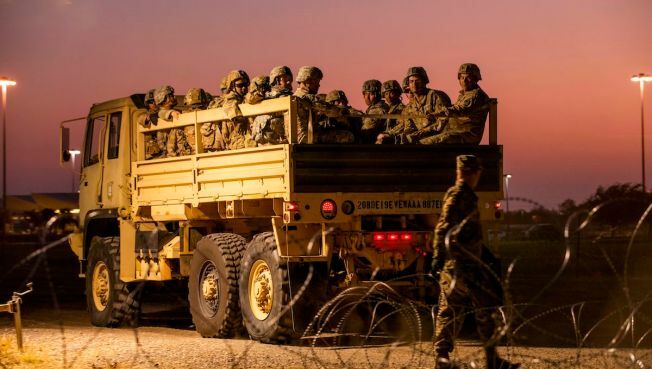 US Army troops enter a compound where the military is erecting an encampment near the US-Mexico border crossing at Donna, Texas, on November 6, 2018. The United States faces a "crisis of national security" because its historic military supremacy has eroded drastically, leaving it likely unable to fight more than a single war at a time, according to a congressionally chartered report released Wednesday. "U.S. military superiority is no longer assured and the implications for American interests and American security are severe," said the report, which was issued by the National Defense Strategy Commission, an independent agency whose board is appointed by the House and Senate Armed Services committees. The report concludes that the Defense Department isn't financially or strategically set up to wage two wars at once and could even lose a war against China or Russia individually, NBC News reported. "The U.S. military could suffer unacceptably high casualties and loss of major capital assets in its next conflict," it said.